The smoke detectors installed by NAS Security are photoelectric and this style of smoke detector is preferred by the professional fire industry because they respond much faster to smoldering fires which cause 75 percent of fire deaths. Most retail smoke detectors are only ionization smoke detectors and will false alarm with cooking, paint fumes or other non-threatening smoke caused in normal home procedures. 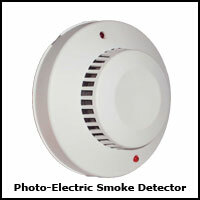 The benefit of having smoke detectors incorporated in your alarm system is the sirens will activate and it will wake you up with any sign of a fire threat and if your alarm is monitored the control room will know immediately that a fire alarm has been activated and they will notify the key holder, the police and the fire department if they are required. According to the National Fire Protection Association (NFPA) fire is the third leading cause of accidental death and most of these deaths occur whilst the occupants are asleep at night. Smoke detectors incorporated into the alarm system have a backup power supply so even when the power supply to your premises is out the smoke detectors still operate. The Consumer Protection Safety Commission has statistics that state when fire strikes 30 percent of stand alone smoke detectors do not work. The number one cause is the batteries were dead or the batteries have been removed and never replaced. The smoke detectors installed by NAS Security have a self testing mechanism and you will know immediately if you need to call us as the light on the detector will flash rapidly, or make a chirping sound and if your alarm is monitored it will send a report to the control room notifying us that maintenance is required.